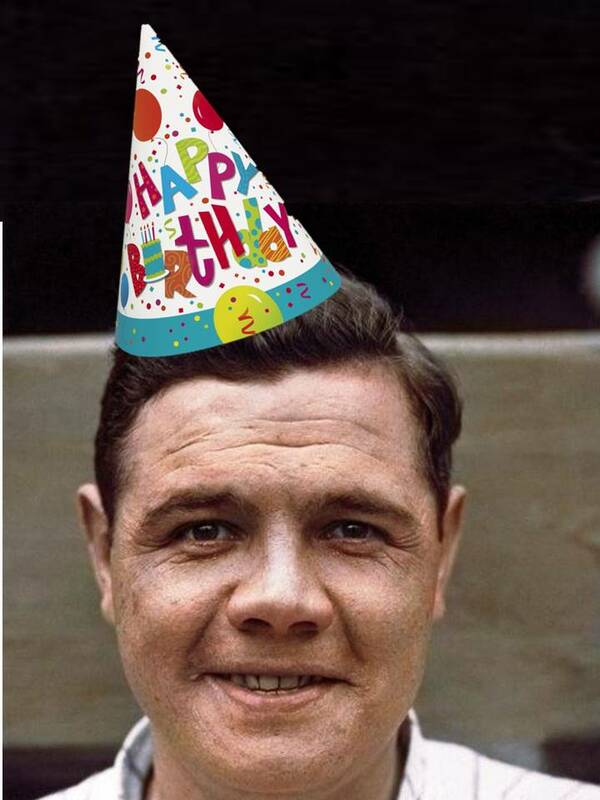 Why does Detroit have a Babe Ruth Birthday Party? There used to be a wonderful little bar in Detroit on Grand River Avenue called Bar Thoms Little Club. 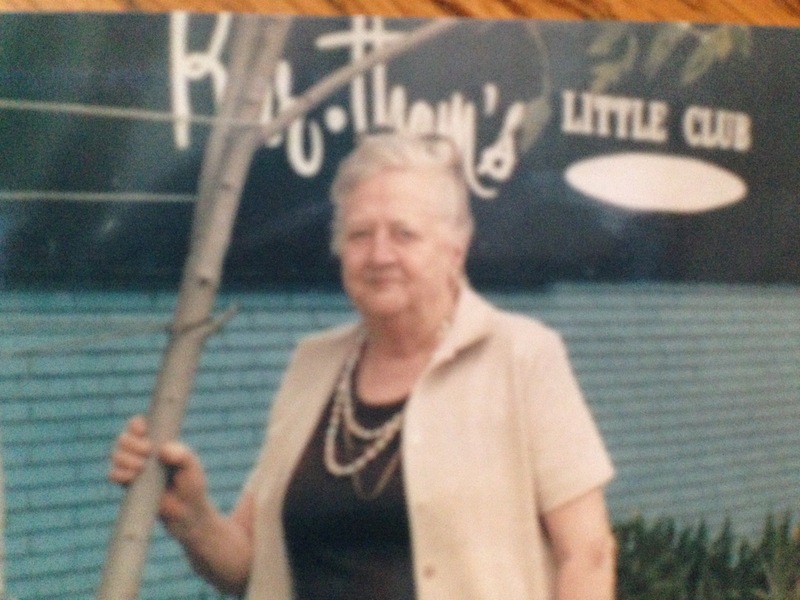 This North Rosedale Park joint was owned by a feisty octogenarian named Ethel Thompson. While I didn’t share Ethel’s political views, I absolutely adored her delightful little neighborhood joint, and especially her jukebox. I was 24 years old in 1987, and I grew up listening to classic rock and blues music. Ethel’s jukebox was a welcome change of pace, loaded with big band classics from the 1930s and 1940s. Most of the regulars at Bar Thoms were between 65 and 90 years old, so the record selection made sense. I usually frequented Ethel’s bar with my friends Mike Dilworth and Kevin Donner. They were cold and satisfying, and bottles were just a dollar. Quite often, Ethel wouldn’t even charge us; we’d just reach over the bar and grab our own beer from the cooler. 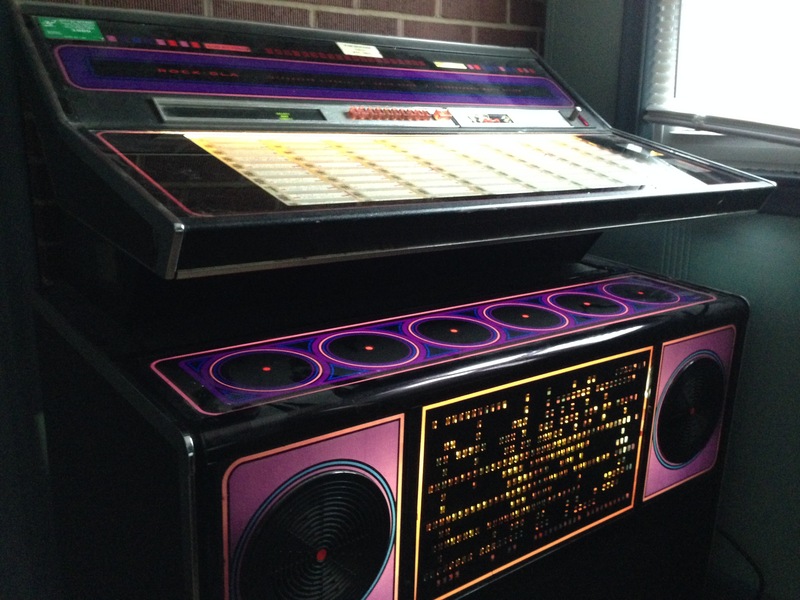 While our dollars were spent on beers, our quarters went into that old Rock-Ola jukebox. We marveled at the sounds of Glenn Miller, Benny Goodman, Harry James, and the Mills Brothers. I also discovered a silly old version of “Happy Birthday” by a group called the Sunsetters. Ethel hated that record, so naturally I played it all the time just to annoy her. Ethel would holler, “Whose f*cking birthday is it now?” Then I came up with an idea. I had an extensive collection of baseball memorabilia, which included numerous photos of old-time ballplayers. I started bringing in a framed photo of a player who was born on that date. I would play the birthday song, Ethel would ask whose birthday it was, and I’d pull out the framed photo and set it on the bar. The regulars at Bar Thoms got a real kick out of this, and I continued this routine throughout 1987. On November 21, while toasting to Hall of Famer Stan Musial, who was born on that date in 1920, I started to look forward to the upcoming birthdays. I knew that Johnny Bench was born on December 7, Ty Cobb on December 18, Al Kaline just a day later, Hank Greenberg on January 1, and Jackie Robinson on January 31. Whoa, hold it right there! Babe Ruth? I couldn’t just bring a photo to the bar for Babe Ruth’s birthday. This called for a party! 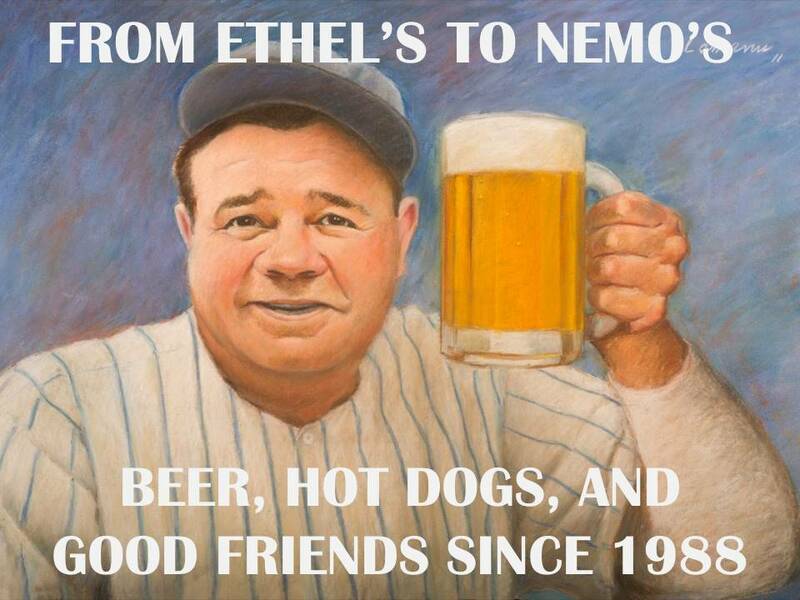 The Babe loved beer, hot dogs, cigars, and living large. I had plenty of Babe Ruth photos, and other collectibles. 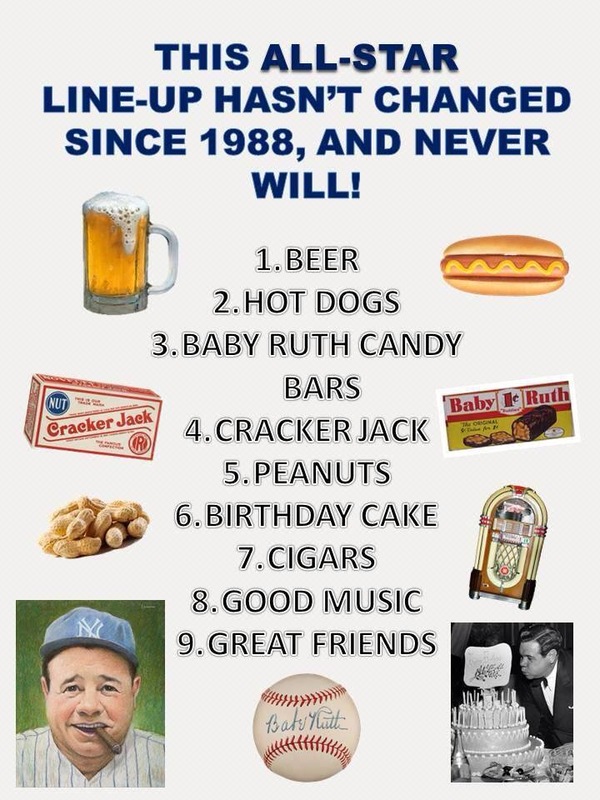 Throw in some Baby Ruth candy bars, Cracker Jack, peanuts, birthday cake, and balloons. It seemed like the perfect theme for a party. 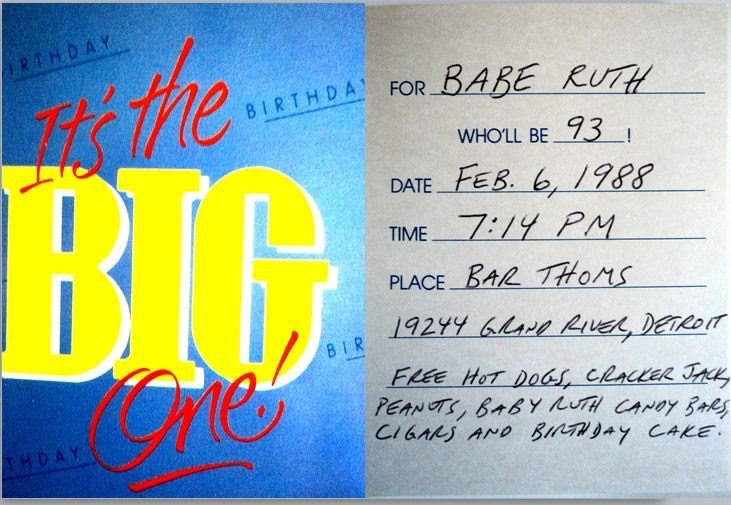 I started working on the Babe Ruth Birthday Party that very day, November 21, 1987. I couldn’t wait for February 6, 1988. I had never heard of anyone throwing a party for a baseball player, let alone a birthday party for a ballplayer who died in 1948. But the theme made perfect sense to me, and I starting spreading the word to my friends. The reception to my idea was not positive. Undeterred, I continued plans for the event. I referred to the party as “The Big One.” I didn’t know if anyone would show up, but this was about Ruth, and everything about Ruth was BIG. I started to gather together my Bambino memorabilia. I had a couple of Ruth statues, some Ruth posters, and numerous photos. I purchased some “Happy Birthday” banners, balloons, party hats, and started searching for the perfect invitation cards. In December of 1987, I was delivering the mail at the Grandland Shopping Center at Grand River and Fenkell in Rosedale Park. I walked inside the Hallmark store, dropped off their mail, and then went to look at their selection of birthday invite cards. I immediately found the right set. The front of the card said, “The Big One.” I bought all the packs they had in the store. I spent hours writing out the invitations. I included a Babe Ruth quote with each one, and I made sure not to repeat a quote. No one would know, and no one would care, but I was fanatical about detail, even back then. I mailed out my invites, and waited for a response. And waited. And waited. Then the phone rang. It was my old friend Mike Dilworth. Mike wasn’t much of a baseball fan, and he still isn’t. But he thought the idea was ridiculous, and he wanted to be a part of it. Phew! I was relieved. At least I wouldn’t be the only person there. Mike drove over to my house on Stout Street around 6 p.m. on February 6, 1988. 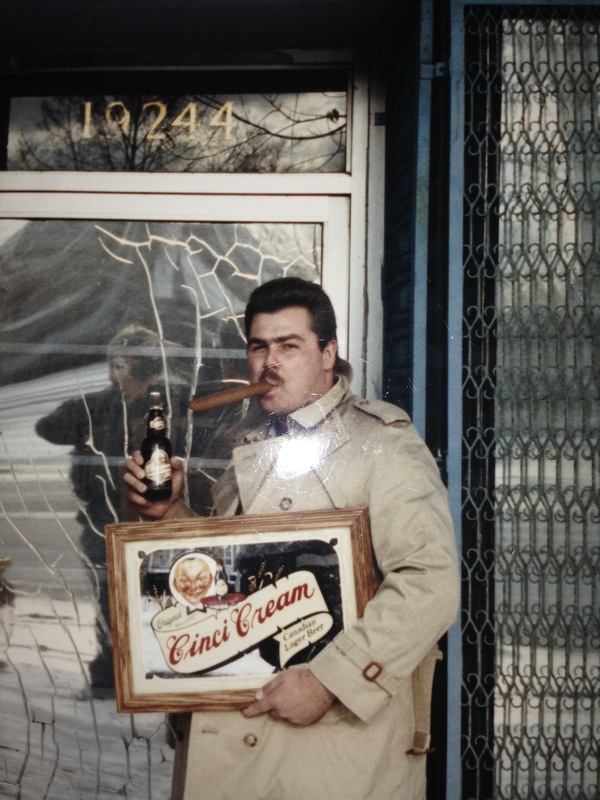 We loaded the Ruth collectibles, banners, cigars, and food into Mike’s 1965 Chrysler Newport, turned east onto Grand River, and headed toward Bar Thoms. Ethel was there, of course, along with her bartender, Billy Walker. We took the hot dogs and buns into the kitchen. We placed the Baby Ruth candy bars in bowls that were set on the tables. We also set out Cracker Jack, cigars, peanuts, and the birthday cake. Mike and I taped up some balloons and posters on the walls, the Happy Birthday banners, and we set some framed photos on our table, along with a large statue of the Bambino. 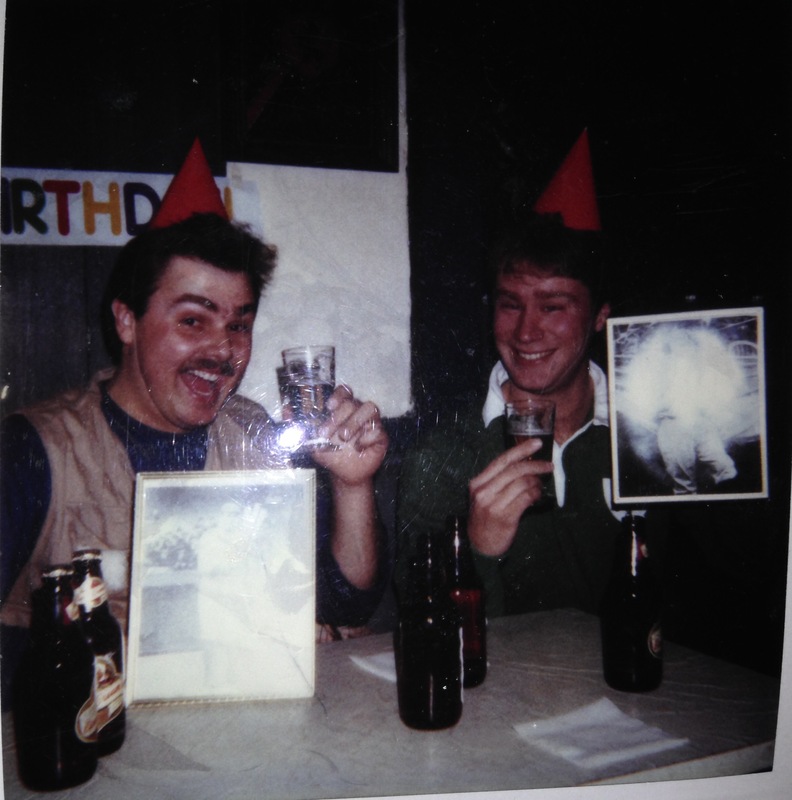 Mike and I donned our silly party hats, tossed some quarters in the jukebox, and started drinking beer at 7:14 p.m.
By 8:14, our table was covered with empty bottles of Cinci Cream. Mike and I laughed. We didn’t care. We were having a blast. Around 8:30 p.m., my old friend Jim Crawley showed up. Then my buddy Miles came through the door. Eventually, there were 12 of us at Bar Thoms. We cranked that jukebox and sang along to the amazing music of the Ink Spots, Tommy and Jimmy Dorsey, Frank Sinatra, Artie Shaw, Al Jolson, and Louis Armstrong. And, of course, we blasted the birthday song over and over (just to annoy Ethel). We stuffed ourselves with hot dogs, Baby Ruth Candy Bars, Cracker Jack, peanuts, and birthday cake. We smoked Ruthian sized cigars and drank beer. We partied and celebrated in the manner that The Babe would want to be remembered. I believe The Bambino was with us in spirit that night. We transformed Ethel’s bar into The House That Ruth Built. The party was perfect. The party was magical. It was the greatest night of my 24 years on earth. As I sat there with my friends that night, I knew I had to repeat it a year later. Thirty-one years have passed since The Original Babe Ruth Birthday Party. But the party remains the same. As I’ve moved, and as the celebration has grown, the venue has changed five times. I’m always collecting new items to display, but the party never changes. If it ain’t broke, don’t fix it. It ain’t nuthin’ but a 1988 party, but it never gets old. This silly theme still works in 2019. Why is that? I believe it’s because of the impact that Babe Ruth had on our nation. He had an effect on people that was unmatched by any other athlete. That impact exists to this day. Babe Ruth made Americans happy in 1914. He still makes us happy in 2019. So come on down to Nemo’s Bar in Detroit on FebRUTHary 2, 2019 at 7:14 p.m. Grab a hot dog and a cold bottle of beer. Raise your beer up high and toast to the Big Guy. Tom Derry’s 32nd annual Babe Ruth Birthday Party takes place at Nemo’s Bar & Grill Saturday, February 2, at 7:14 p.m. Nemo’s is located in Detroit at 1384 Michigan Avenue, just a block east of the old Tiger Stadium site.